Since the late summer, our 8 year old, Michael, has been taking Karate lessons. Taking him to classes a few days each week, I've come to appreciate a number of lessons modeled by Family Karate that are worth sharing with teachers everywhere. 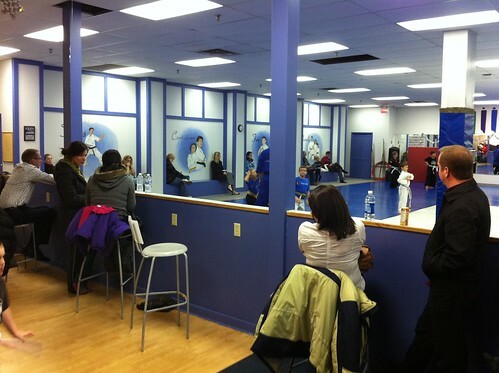 Classes at Family Karate take place in an open space that allows outside observers to take in the lessons. Teaching isn't secretive. Up close and personal, parents can observe the work of students and teachers alike. What would happen if the doors of our classrooms were open to any parent, any day? In academic classrooms, the grouping of learners as Robins or Rockets may be seen as 'old school', but ability grouping in karate is the norm. 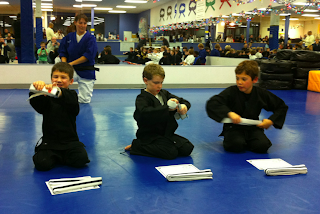 Classes are divided by belt colour allowing instructors to address the KYU Belt Curriculum with similarly skilled students. How do you ensure apt challenges for each student? Within any given colour, students earn experience 'stripes' as they master skills within the curriculum. 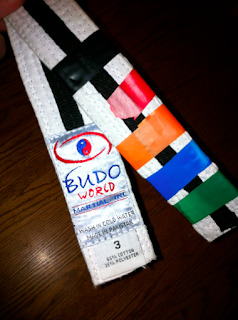 Vertical strips of coloured tape on a learners belt indicate when a student has mastered specific karate skills. These readiness markers are used by instructors to ensure students are appropriately challenged during drills. Did karate masters begin as 'sticker' kids? What if scholastic learning was highlighted through public signs/symbols? Beyond karate, our club emphasizes the development of social skills and leadership skills. Respect for self, parents and peers is reinforced daily, and students with advanced belts are expected to assist the Renshi, Sensei or Sempai in working with less-experienced students. This leadership expectation is one that reinforces skills in addition to providing a service to the club. What can happen when advanced students spend some of their time teaching others? Individuals attend karate classes at a schedule that suits the family and the individual. Students can pursue traditional karate skills, or they can choose to focus on self-defense. Students can advance to sparring and recreation or they may pursue competitive karate. Regardless, the pace of one's learning is dictated by skill development and interest rather than by age. How authentic are the choices you and your fellow learners are allowed to make? Healthy eating, respectful behaviour, and diligence in schoolwork are a few of the social skills reinforced and rewarded at Family Karate. Through the use of home tracking cards, parents can reinforce positive behaviours that are later recognized at graduation ceremonies. In addition, monthly 'special events' including sleepovers, movie nights, and pot luck events reinforce the community nature of the sport. How does your school engage members of the community? The skills of karate have been practiced for a few hundred years and the respect for the art is central to the teaching and learning of skills. Beyond the cap and gown, I'm hard-pressed to find ceremonies or symbols that represent the rich history of school-based learning. What traditions make your school a special place? At Family Karate, the Student Creed is a hallmark. The words appear on the walls and are emblazoned on the back of every student's shirt. Does your classroom/school/board have an axiom that frames all learning?